After a successful launch on iOS, Ruzzle creator MAG Interactive has announced the launch of Ruzzle Adventure on Google Play for Android devices. 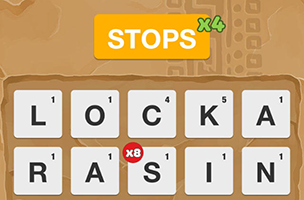 The game passed one million downloads within its first three days on iOS, and challenges players to complete levels by creating words with randomized letter tiles on the board. Levels come in a few major types, which gives variety to the experience. One, for instance, may simply require gamers to earn a large number of points, while another may include stone squares or wooden blocks that must be removed before clearing the level. These stages are casual experiences, while water levels see gamers racing to make any word they possibly can to escape the water rising from the bottom of the screen. Ruzzle Adventure offers over 150 levels, and supports score sharing with friends via the game’s leaderboards, or Facebook and Twitter. Available in 12 languages, Ruzzle Adventure can now be downloaded for free on Google Play.